Duo is a green and curious feather ball who will never grow tired of discovering new cultures and learning new languages. Our strigine friend has travelled the world far and wide. The detailed accounts on these journeys can be found in The Duo Travel Guide. He has even visited places that mere mortals such as yours truly could never experience by stepping on their streets and wandering in their forests. Their air is not meant to be breathed in by our kind. But Duo has gazed upon the dragons of Alagaësia and has listened to the ancient songs of the elves of Middle-earth. So how is this possible? 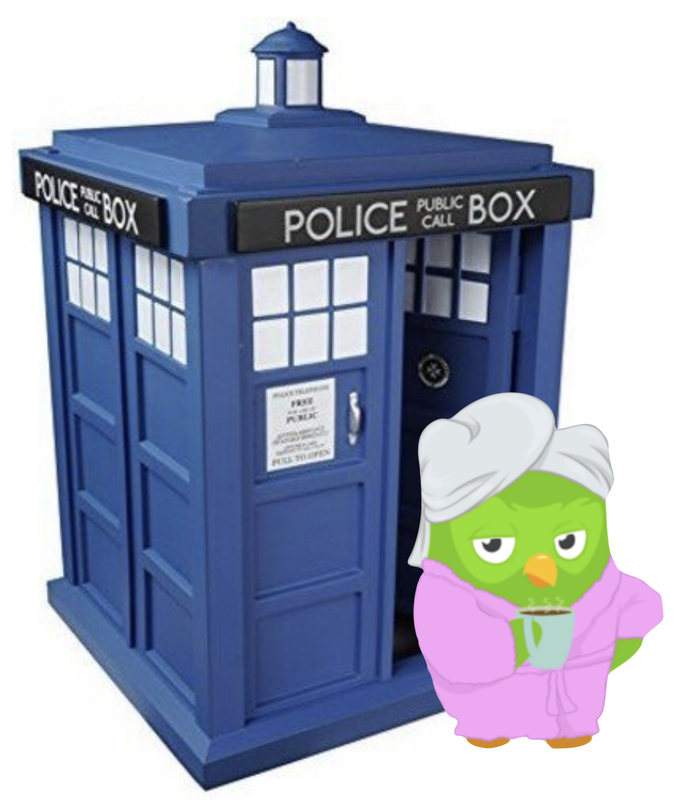 Well, Duo has a friend with an interesting form of transportation, to which the owly traveller has made some modifications that allow him to visit other dimensions. He borrowed this wonderful device once again to go on a new adventure and arrived back home not long ago. Why don’t we knock on the door right now and say hello! Ahem. Sorry. I suppose it is a bit early. You have your coffee, Duo, and I will tell everyone where you went this time. 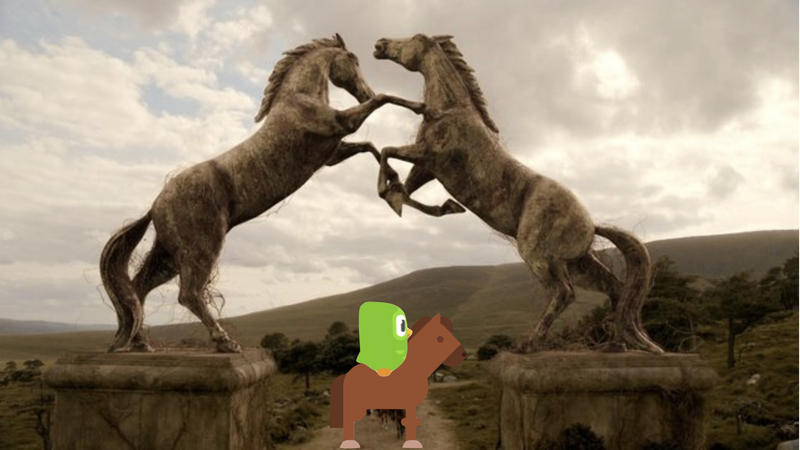 Duo visited two continents on Planetos. 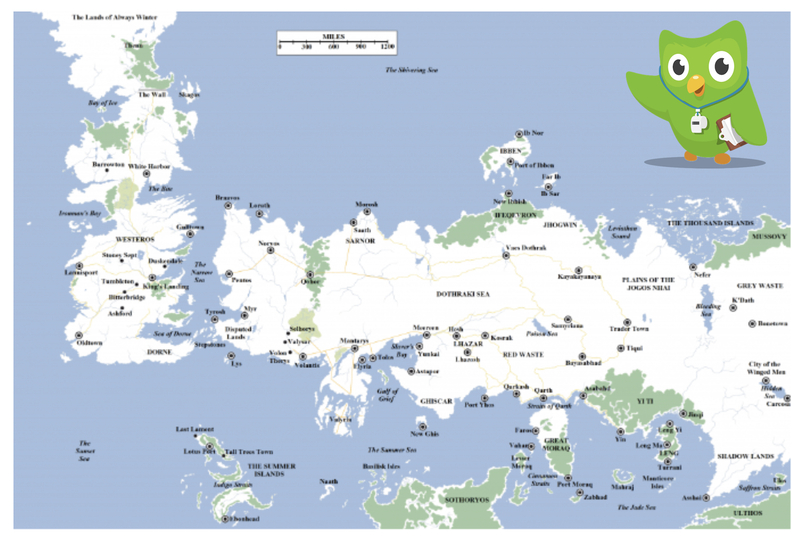 The one to the west is called Westeros and the one to the east is known as Essos. They are separated by the Narrow Sea. Several languages are spoken in the area and Duo is already fluent in one, High Valyrian, thanks to Dedalvs, who has created a course in the language right here on Duolingo. How Dedalvs managed to become fluent in High Valyrian is a bit of a mystery. Perhaps he has a blue box of his own. 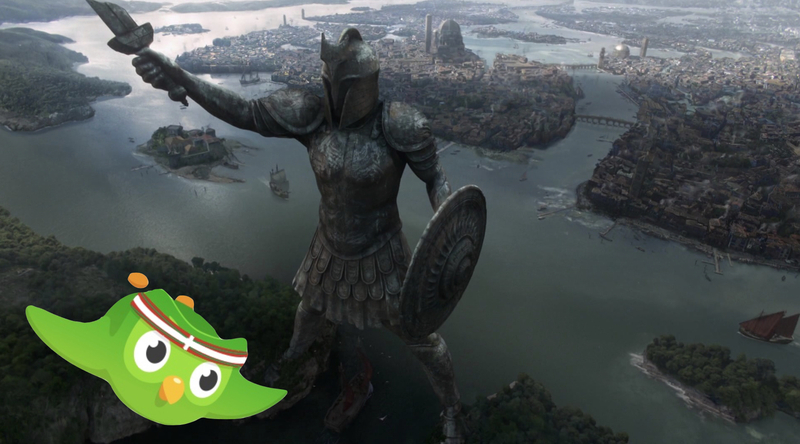 Duo started his journey in the city of Meereen, which is located at the mouth of the Skahazadhan River at Slaver’s Bay in Essos. He made sure that his vehicle’s translation function was turned off, so that he could listen to Low Valyrian spoken in the shadow of the pyramid. He soon discovered that the local dialect of Low Valyrian contains many words from a dead language called Old Ghiscari. The word buzdar caught his ears several times. A very flamboyant sellsword told him that the word means “slave”. 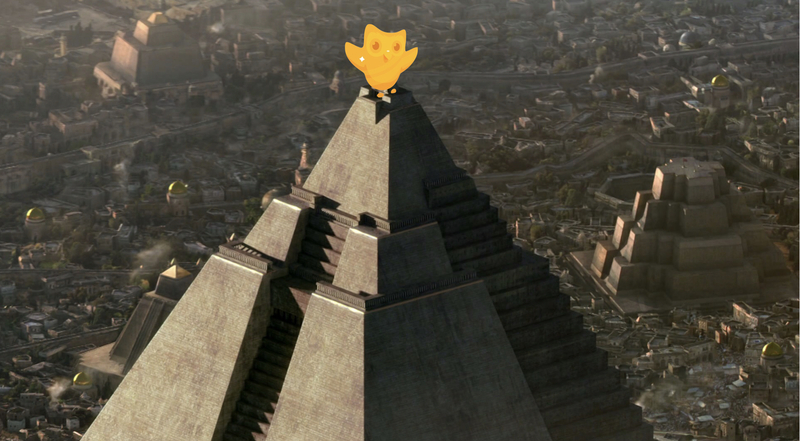 Duo was rather shocked by this discovery, but sadly his wings were tied, so he settled for replacing the harpy on top of the great pyramid just for a few moments. 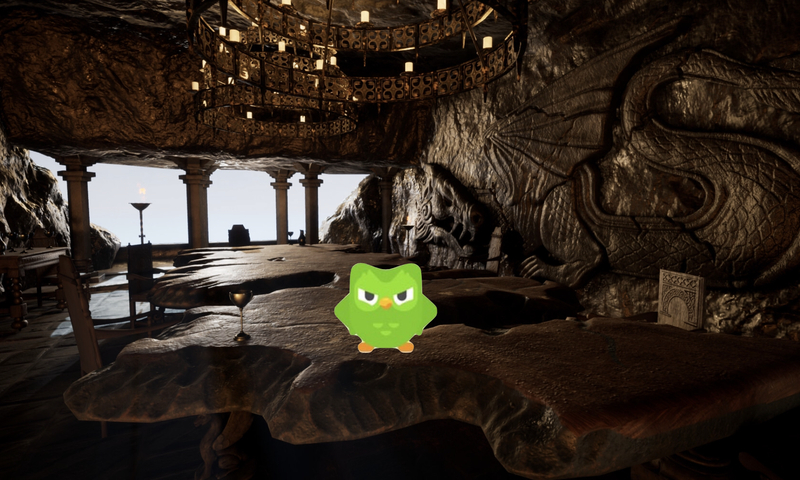 Then Duo continued his journey by going to Vaes Dothrak. He hid his vehicle in the tall grass of the Dothraki Sea and entered the settlement on horseback (Hosh!). The place seemed pretty quiet and mainly inhabited by women and children. Soon he discovered that the most powerful of their Khals had ridden west to marry and his khalasar went wherever he went. Duo perched on one of the beams of their temple and listened to women talk about the Great Stallion in their fascinating language. Eventually Duo moved on to Valyria. 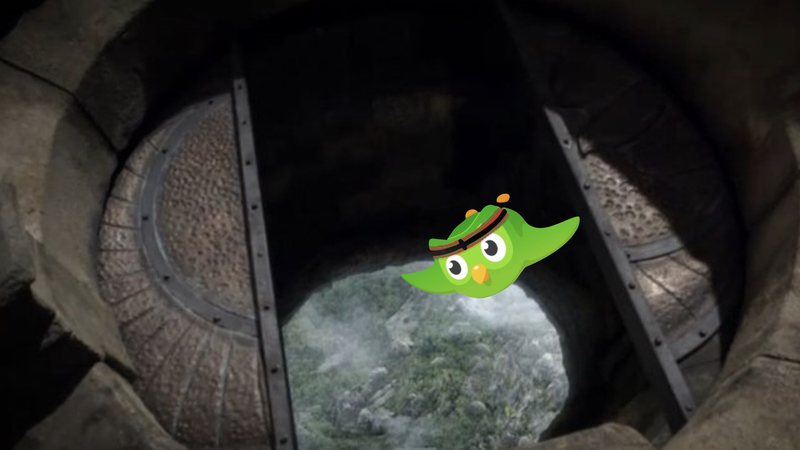 The home of the language so many in Essos still speak lay in ruins, haunted by ghosts of former glory and decadence, and, for a short while, also by a green bird wearing a bedsheet. No people, no cities, no dragons. The Doom had taken them all. 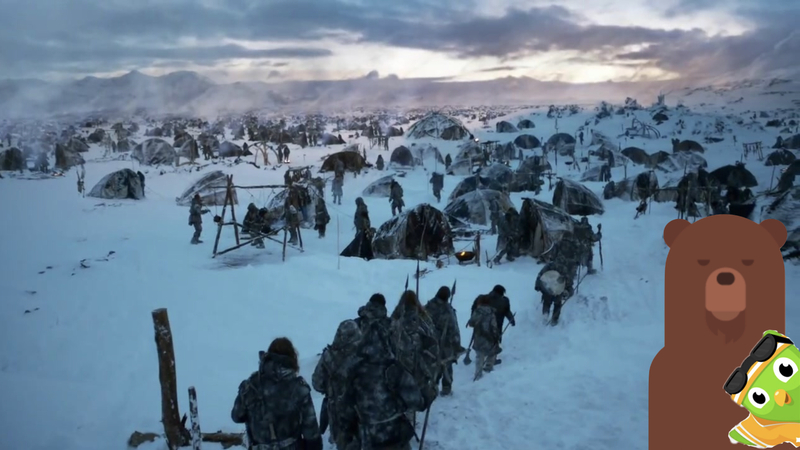 Then Duo landed in Braavos, a busy mercantile city by the Narrow Sea established by former slaves. He parked his ride on the shoulder of the Titan that guards the entrance into the city harbour and flew across the city listening to the many languages spoken in the largest cultural melting pot in Essos. He could hear merchants conversing in Low Valyrian of several types and sailors singing in Summer Tongue. Moonsingers and priestesses of R’hllor walked in the crowd. In the busy streets Valar Morghulis is answered with Valar Dohaeris. Duo was getting a bit peckish, but luckily the people at The Iron Bank were very interested in the blue gems Duo wanted to exchange for coins, so that he would be able to buy some delicacies (although the bankers were rather suspicious of lingots). 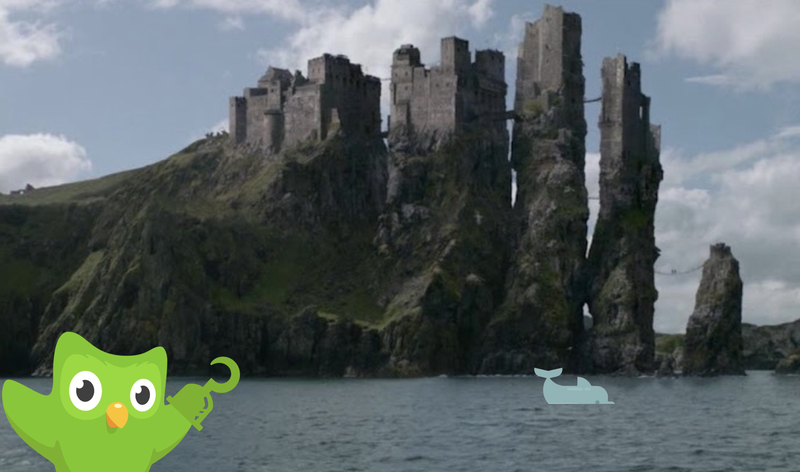 Duo crossed the Narrow Sea and arrived on the isle of Dragonstone close to the shores of Westeros. All the people on the island, like everyone else in Westeros, speak the common tongue of Andals, a language Duo had already heard spoken in Braavos. Duo was very happy that his transport could translate everything said around him, since - although he knew that a man by the name of George R.R. Martin is able to translate the tongue into English - the language was completely foreign to him. 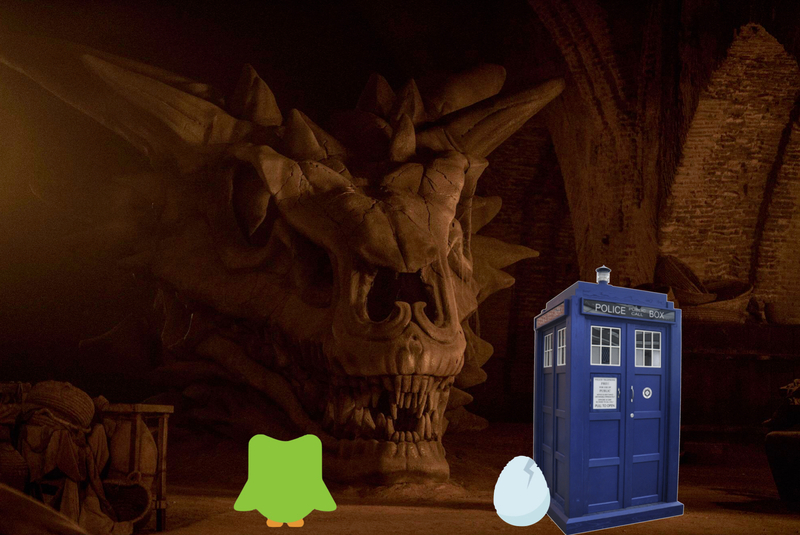 He quietly followed an exceedingly nice onion man around until he lead him to a lovely and very bookish young girl who was more than happy to tell the little owl all he wanted to know about the past kings and knights of Westeros. From Dragonstone, Duo headed to King’s Landing, the capital of Westeros. He got lost in the dark tunnels under the Red Keep and you could have knocked him over with a feather when he suddenly found himself in front of the skull of Balerion! He had bought a dragon egg from a strange Asshai’i sailor and placed it close to the skull in the hope of something extraordinary happening. Nothing did, so he decided to take the egg into his Incubator once he would get back home. Once he found his way out of the tunnels, he ventured into the Throne Room, although in disguise. People were very busy, because they were preparing for the lying in state of a man who had served as Wing of the King (or something like that). Only one man, a portly fellow with a shaved head, seemed to be suspicious of him. 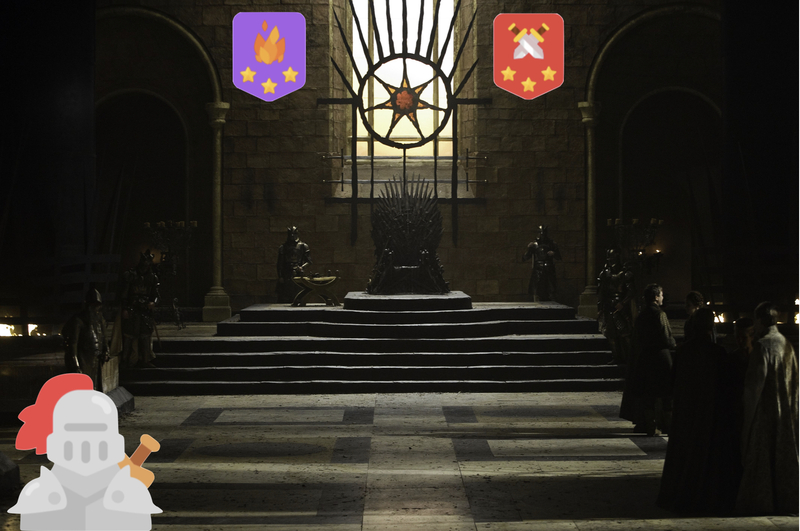 Duo used the general confusion to his advantage and placed some familiar looking coats of arms on the walls of the room. Ladies in fine feather and knights in golden armour walked in the Throne Room. Duo thought that while it would be nice to be waited on wing and claw, this city seemed a very dangerous place to live in. Duo decided to fly to Old Town before he would ruffle someone’s feathers in the capital. The library of the Citadel took his breath away. It was a haven for books on history, medicine and languages, including a dictionary of Dothraki. The maesters were a bit strange though. 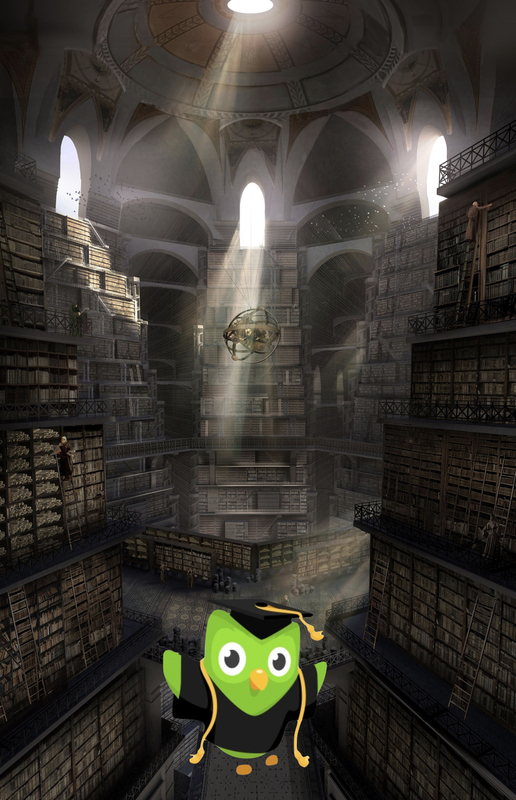 They seemed to have collectively decided that Duo did not exist, even though it was impossible for him to remain unseen in the library. He even tried to address some of the maesters, but they stayed adamant in their oblivion. 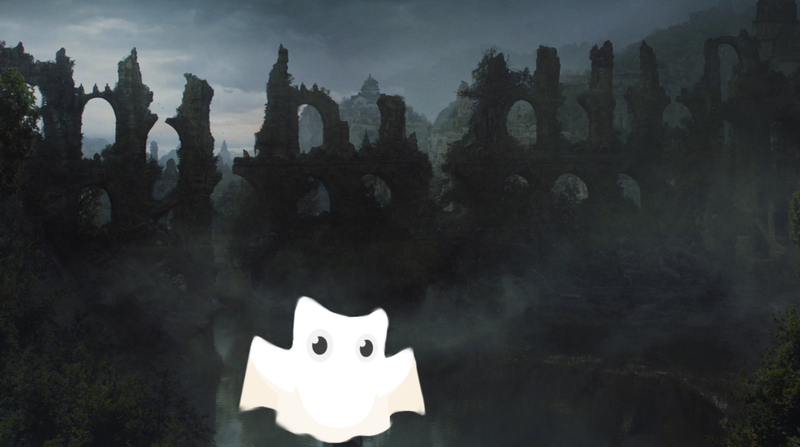 After quenching his thirst for knowledge, Duo travelled to Pyke on the Iron Islands. He decided to get his wings dirty on one of the many fast ships in the Iron Fleet. All wings on deck! Unfortunately, it did not take him long to grow very weary of his crew mates. He then flew to the Vale surrounded by the Mountains of the Moon. The Eyrie seemed to be the biggest and best nest around, so he headed there. He was a bit careless in his attempts to remain unnoticed and the mistress of the Eyrie had a hissy fit when she saw him. She had him thrown out through something called the Moon Door, which he had heard many people speak of in fear. Duo did not quite understand what all the fuss was about and simply spread his wings to fly back to his vehicle and to continue his itinerary to the North. 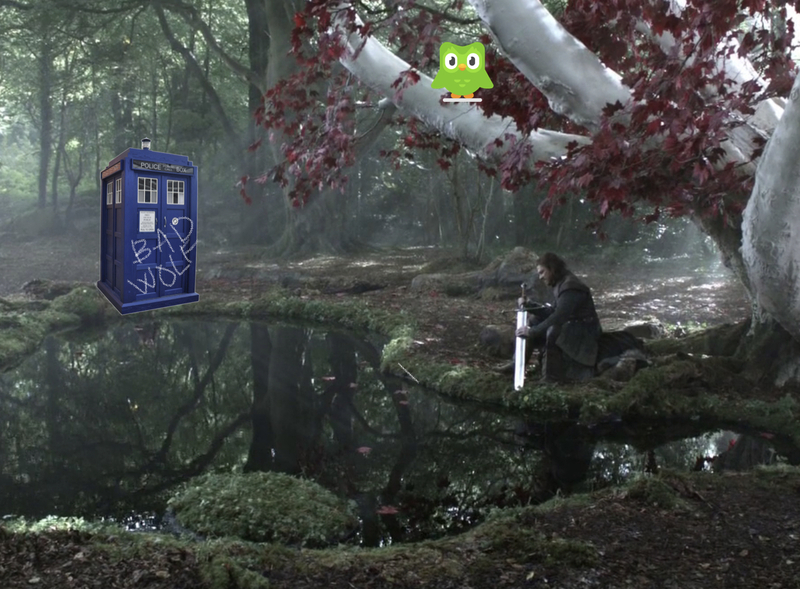 He landed in the godswood of Winterfell. There he observed a man cleaning his longsword in the clear waters of a spring under a weirwood tree. Later, he followed the man silently in the halls and corridors of the castle and grew quite fond of the old chap and his children. The weather in the North was rather nippy, but the castle was surprisingly warm unlike most such buildings, which tend to be damp and draughty in the autumn. Duo absorbed all the warmth he could into his hollow bones, for he was to travel even further to the north. The Wall is without a doubt the largest construction Duo has ever seen. It is so big that there is not much to say about it, so one can only stare at it in awed silence and wonder why such a thing would be built in the first place. The weather was still warm and the side of the Wall sweating water glistened whenever the sun chose to peak through its cloudy blankets. 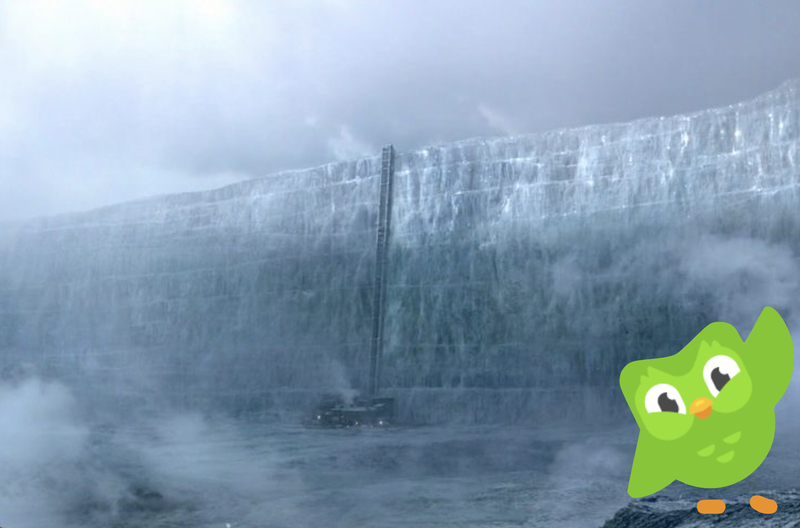 Finally, Duo ventured beyond the Wall to the Lands of Ever Winter. He really hoped he had packed warmer clothes with him, so he asked a local she-bear to help him stay warm. He saw people beyond the Wall living in harsh conditions. Some of them speak the old tongue of the First Men. He also spotted giants (!) there, who speak a variety of the same tongue called Mag Nuk. Duo rather liked the Free Folk, as the tribes living north of the Wall refer to themselves, but the visit ended unpleasantly when one of them tried to, uh, enter his head and control him. The bear had her misadventures too. Duo gave her a lift to an island close to the western end of the Wall and headed home. Duo knew there would have been much more to see; the vineyards of Dorne, the green and lush Riverlands, the cliffs of Casterly Rock, the streets of the Free Cities. And there would have been much to hear too; Lhazareen, Ibbenese, Qartheen, Asshai'i, the many languages spoken in Sothoryos. But his trip had been long and the idea of his own nest felt dear. He wondered what would happen to the kind onion man and the little girl with her books, the giants and the free tribes, the slaves and masters of Meereen, the bankers and priestesses of Braavos, the knights and ladies in King’s Landing, the quiet Northener and his family, the sellsword at Slaver’s Bay. Where will the horse lords ride? Where will the Ironborn sail? If only there were a way to find out. Well, it is not as if he has to leave Planetos completely even at home. The best Duo goes to...... ever!!! You have done a great job on this one and I thank you! This story has made me a die-hard fan of this series! A reminder: if you wish to send Duo somewhere, please read The Duo Travel Guide and the posts it links to and leave a comment in the discussion of the travel guide. Do one where he goes to Nilfgaard and the Northern Kingdoms. I have yet to get into the series (neither the books nor the soon-to-end show) but I still enjoyed this edition of Duo Goes anyway! This is truly amazing! EDIT: Congrats on how active you are on both Memrise and Duolingo. I could never keep both up like that. Well, I wasn't expecting to see myself in this post! It was nice travelling with you, Duo. Duo, fly back to Essos immediately!!! Thankfully you did not see what is coming down from the North. WINTER IS HERE!!! The show is not my cup of coffee, but this post made me realize that I love that heckin owl. Duo gets a special cozy place in my heart. User Zzzzz... thank you very much for making this! I am looking forward to checking out the rest of your fun series as well.